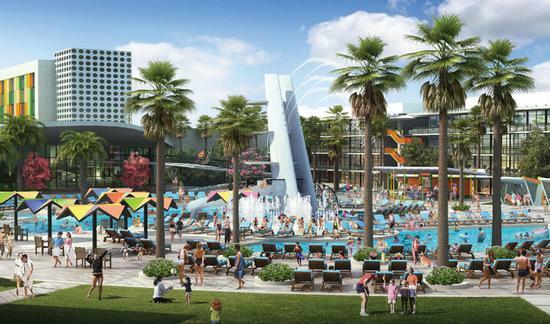 Splash back to the 1950’s and 60’s for endless family fun at Cabana Bay Beach Resort, at Universal Orlando Resort, opening early 2014. From the moment you arrive, you will be taken back to the iconic beach resorts of the era. Go for a swim or relax in the lazy river, grab a burger and a milkshake or take the family for a game or two at the bowling alley. 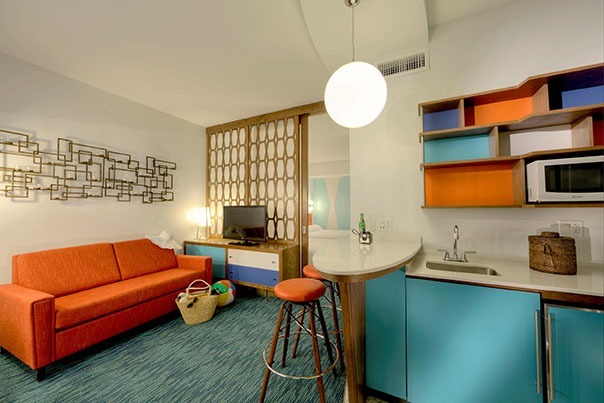 Take a road trip to Universal’s Cabana Bay Beach Resort and enjoy exclusive theme park benefits. Download or print a flyer. Hideaway Bar & Grill: Tropical bar and grill located by the south courtyard pool (lazy river), featuring a simple grill menu with 5 – 6 optionsand afull bar serving signature frozen and non-frozen drinks, smoothies, wine by the glass, bottle & draft beer ; walk-up service. Entertainment includes music and recreation staff that will host activities such as hula hoop contests and bingo throughout the day. Atomic Tonic: Poolside resort casual bar located by the north courtyard pool (dive tower) featuring a full bar serving signature frozen and non-frozen drinks, smoothies, wine by the glass, bottle & draft beer and limited prepackaged snacks; walk-up service. Entertainment includes music and recreation staff that will host activities such as hula hoop contests. Also ping pong, and volleyball equipment will be available.